When my grandpa was recovering from a stroke, five-bypass heart surgery, and having issues with his blood pressure, he was limited into what he could do with his free time. It’s a question we all might face after a major medical diagnosis or surgery. And with my grandpa being around eighty years old at the time, his options were more limited than ever before. What was an outdoorsman who loved mechanics going to do when he was forced to recover? The answer, he decided, was to learn something new. Now I know a lot of people say that learning a new skill grows in difficulty the older we get. But for my grandpa, he was bound and determined to do something with his time. He wasn’t about to sit idle and do nothing. He also wouldn’t let age keep him down and out. If he couldn’t work his body, he could at least work his mind! So he learned to knit. It started off slow. He hadn’t really learned to knit much before, and after trying to makes scarves with knitting needles, he found the task almost daunting. But he persevered. 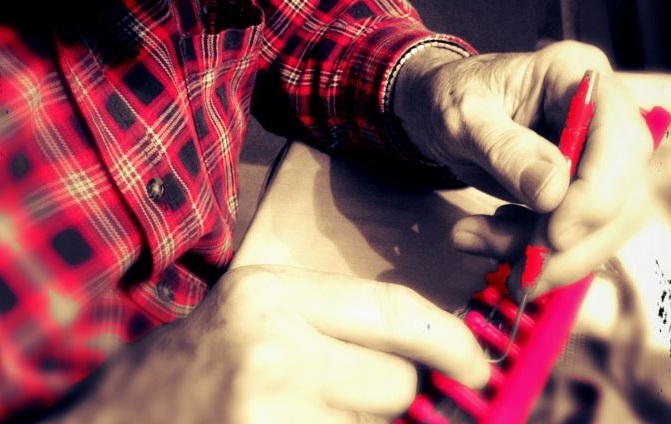 He kept trying and asking for more lessons, and as he rested in his chair, he would whip out his loom (pictured above) and start knitting scarves. During the winter, that became his daily mission, and when Christmas time came, he would get boxes and mail family and friends scarves as gifts. His work became his ministry, and many people (before and after the holidays) were blessed by his thoughtful nature. What I found inspirational, though, through my grandpa’s story wasn’t the fact that he made people happy with his scarves (though that was certainly a treat to see). What made this so special was the fact that even at eighty years old, he still found something new to learn. For the first few months of knitting, he was like a kid in a school room, curious and full of questions to make sure he got everything right. Now, he’s teaching others, and though it’s been a few years since his knitting adventure began, he still hasn’t stopped learning! Now his new craft is making bowls out of magazine papers (which my aunt taught him), and he’s having the time of his life! Is he getting up in years? Certainly. He’ll be the first to tell you that he isn’t as energetic as he used to be when he was young. But to him, life is what you make it. You’re never too old to try new things or learn something you’ve never learned before. You’re never too old to be like a kid and look at the world with curiosity and have fun. You’re also never too old to be brave and never give up. His diagnosis was grim, but through prayer and perseverance (and some really awesome doctors), he’s still enjoying each and every day! This entry was posted on October 28, 2015 and tagged elderly, grandpa, grandparents, heart surgery, knitting, learning new things, old age, recovery, story, stroke, surgery recovery, Writing. Bookmark the permalink.